Besides the deep spiritual significance of Easter lies the cultural traditions that arise from every holiday and holyday possible in every culture. Most of these traditions center around specific foods. Yet why these foods? One common Easter tradition is to serve ham. 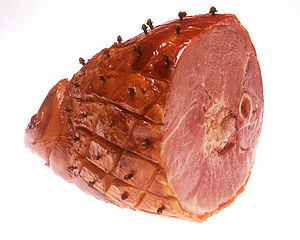 Yes, it makes a great deal of sense in that it’s easy to prepare for a large crowd; however, the reason why ham became a traditional Easter meal is that, after a long winter past harvest and slaughter, ham was one of the few meats still edible in the larder. Likewise we have the lamb. The lamb being slaughtered and consumed holds numerous spiritual aspects with Jesus being the Lamb of God, who was slain for our sins. It is also a Passover food. And spring lambs would have been abundant in a country like England awash in sheep. I won’t get into the coloring and consuming of eggs at Easter. Eggs do symbolize life, which is the entire meaning of Easter—eternal life through the Resurrection; however, the coloring of eggs in spring holds its roots firmly in pagan culture. One Easter tradition that seems to have died out—and with rather good reason—is the consumption of tansy. Tansy is an herb with yellow flowers and lobed leaves that closely resemble ferns. Tansy holds some disputed medical benefits. And tansy is also a poison. 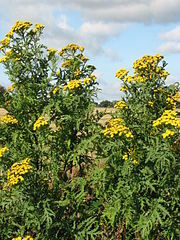 At first, tansy was eaten during lent to symbolize the bitter herbs. Later, it was baked into a pudding. I have found numerous recipes for tansy pudding from ancient housekeeping books, and included a couple in Friday’s upcoming post. These look rather like baked omelets. Why tansy? For one thing, it was usually in leaf by Easter. More importantly, though, tansy is a purgative, a purifying agent. In small doses, it cleanses the system of parasites and other unwanted guests like bacteria. After a winter of eating salt-preserved and smoked meats, dried apples and root vegetables, people probably had collected a worm or two in their systems. (I know—ee-ew.) A slab of tansy pudding, and a body would feel far better. Two slices of tansy pudding, and a body would quite possibly be dead. Be sure to come back Friday and see what it actually took to make the Tansy puddings.